Japan-based renewable energy technology company Eco Marine Power (EMP) has signed a patent licence agreement with Teramoto Iron Works Ltd concerning patents related to EMP’s EnergySail and Aquarius MRE (Marine Renewable Energy) fuel-saving and emissions-reduction solutions. Teramoto Iron Works was selected in 2016 to manufacture the first production version of EMP’s EnergySail ¬– an automated rigid sail device that enables ships to utilise wind power to reduce fuel consumption and lower vessel emissions – and this latest agreement between the two companies “paves the way to full commercial production once sea trials have been completed”. 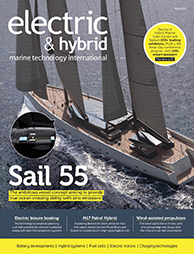 The patented EnergySail can also be fitted with marine-grade solar panels or other devices and used to charge batteries or generate the electrical power that is fed into a ship’s power system. 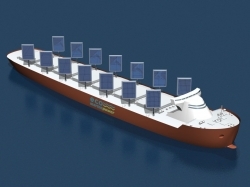 Alternatively, an EnergySail array can be incorporated into EMP’s Aquarius MRE solution.